Kellogg Community College student Crystal Lightfoot is working towards earning her English for Enrichment Certificate. Lightfoot, 28, has lived in Battle Creek for most of her life. She decided to go to KCC because it was close to home, making transportation and accessibility easier. 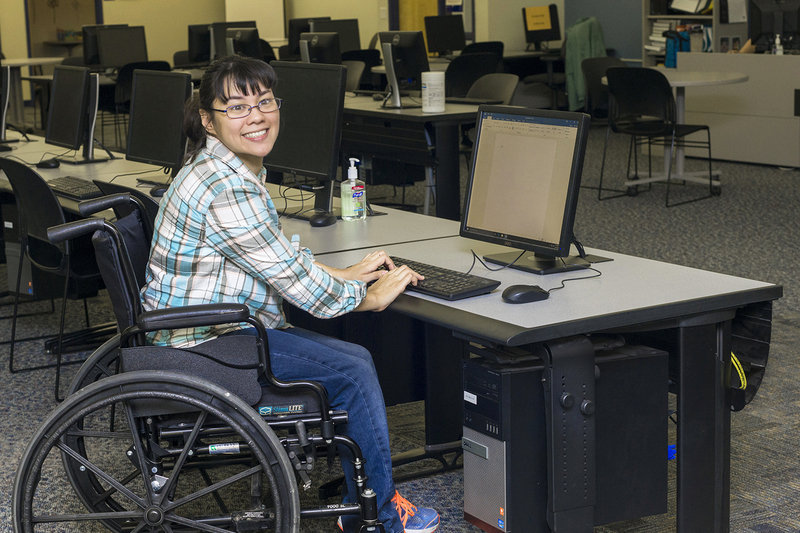 Lightfoot has cerebral palsy, but she doesn’t let it stop her from pursuing her goals. If she ever needs help with transportation, Lightfoot is surrounded with support from friends, family, KCC staff and even other students. Initially unsure of what to study at KCC, Lightfoot talked with her instructors and advisors who suggested she follow one of her passions: writing. Lightfoot enjoys spending her free time writing poetry. One of her favorite spots to work on campus is in The Bridge, which provides educational services to all KCC students, including computer stations and professional staff who are available to assist students with their coursework. A 2009 graduate of Harper Creek High School, Lightfoot has been attending KCC since 2013 and hopes to graduate sometime in the next few years. She hasn’t decided what she wants to do after she earns her certificate, but is considering continuing her education to pursue an associate degree. “It’ll be very gratifying when I earn my certificate,” Lightfoot says.